With so many different kinds of technology surrounding us everywhere, it’s easy to forget or even recognize the various ways we can use it for our benefit. Software is rapidly developing and companies are popping up like mushrooms to bring leading-edge, revolutionary solutions that encompass many spheres of life. When it comes to interactive whiteboard software, these programs offer a plethora of tools that can make teaching and learning a fun process. This comes in addition to the fact that the use of interactive whiteboard and all its software functions are aimed to simplify classroom teachings. 1. Finding essential video clips: Learning becomes much easier when images and videos are brought into the equation. This is why these tools can help teachers find many important video clips related to social studies of science. Not only will this practice for the student’s attention, but also encourage them to develop the habit of learning independently. 2. Create “choose your own trip” stories: With the use of hyperlinks, teachers can send students on their next exciting trip. This will encourage them to build up the plot and create their ending to the story, thus boosting their imagination. Curious minds need fodder to thrive, and nothing can be more useful than encouraging creativity inside of the classroom. 3. Create engaging tutorials math tutorials: interactive whiteboard software comes with built-in screen recording feature that can come in multiple users. One of the uses can be about creating mathematics tutorials to better help students grasp the concepts. Through the use of images to tell a story, students can be motivated to work together in groups to solve problems within an elapsed time. 4. Make students create backdrops for news broadcast: teachers can use the benefits of interactive whiteboard software to make students create backdrops on a current event. They could include texts and images in their backdrops to personalize their broadcast and then deliver it to the class through the IWB. 5. Create exciting categorization activities: By utilizing copy/paste and screen clipping tools, every student can make their own classification page. This software can let students understand the concepts of representing a fraction, categorize animals according to their food habits, and hold a collection of state names within a particular region or country. 6. Use sound recording with interactive whiteboard software: now, teachers can record their student's responses when the talk out loud and keep it embedded in the interactive whiteboard software. They can later play all the students answers in class to facilitate further discussion. Moreover, a sound recording program can also help conducting a class debate on a certain topic by keeping the records embedded into separate pages of the whiteboard. 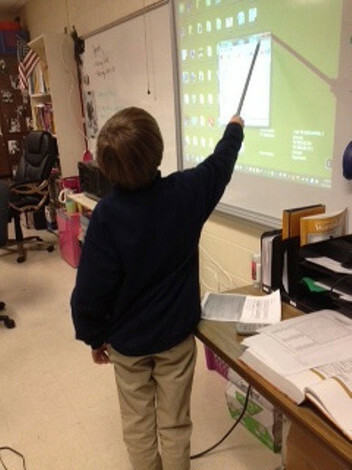 As a teacher, you're missing out on a lot by not knowing the ins and outs of interactive whiteboard software. Even though it's not necessary that you should be a pro in using this technology, implementing some of the tips we mentioned above can certainly put you in a better position to teach in class. So, go ahead and get experimenting.